Jeremy R. asks: Was Scotch tape invented by the Scottish? Despite the name, Scotch tape wasn’t invented by the Scottish. It was invented by a college dropout named Richard Drew from Minnesota who worked for a small sandpaper company founded in 1902 called Minnesota Mining and Manufacturing, later known as 3M. The name “Scotch” itself has an origin story almost as interesting as the invention of Scotch tape. Born Richard Gurley Drew in St. Paul, Minnesota in 1899, Drew spent a year at the University of Minnesota in the Mechanical Engineering program before dropping out. He paid for that time at school and his correspondence school course in machine design by playing banjo, and he included all of that information in his application to the open position of lab technician with 3M. He got the job and was set on the path to make history. In the 1920s, a two-tone paint job was popular for cars and a headache for automotive painters. The two-tone look was created by painting the car one color, applying a barrier of some sort to the painted portion, and then painting the next section. In order to get around the difficulties of this type of paint job, painters and mechanics tested out different ways to achieve the look. Unfortunately, their attempts tended to be less than successful. Some automotive shops would glue newspapers over the already painted sections while others used tape to prevent paint transfer. However those techniques often left a sticky residue on the paint that was difficult to remove. Sometimes, it would even mean the painters had to do the entire paint job over again. One of Drew’s responsibilities at 3M was to deliver samples of sandpaper to local automotive shops for testing, where he often overheard workers who were painting complain about the problems with tape used for these paint jobs. The twenty-three year old then lab assistant got the idea to create a new tape that would create a seal so that the paint wouldn’t get through and yet also come off clean without leaving any sticky residue that ruined the paint finish. Drew used the adhesive that 3M utilized in the construction of its sandpaper as a starting point. From there, it took him two years of experimentation with different types of adhesives that he applied to a crepe paper backing to come up with the right combination. Thus, what would be called “Scotch” Masking Tape was born in 1925. The success of the Scotch Brand Masking Tape allowed Drew to move up the ranks at 3M. In 1929, his position as technical director at the fabrication laboratory allowed him to pursue another idea. Cellophane had recently been invented by DuPont and was being used by grocers and bakers as a neat way to package their groceries. However, there wasn’t a good way to seal the cellophane with tape because the colored backing ruined the clear look. So Drew and his team of inventors worked to create a tape that used this clear cellophane as a backing. Unfortunately, the machinery that 3M used in order to apply the adhesive to the cellophane backing tore the material, and the glue that worked for the masking tape appeared amber on the clear cellophane. The team ultimately invented new clear adhesive and modified machinery to handle the cellophane. The new tape was called Scotch Brand Cellulose Tape, but it appeared that it might have missed its opportunity with grocers and bakers despite ringing endorsements from several test clients. You see, DuPont had introduced into the market a cellophane that could be sealed with heat. 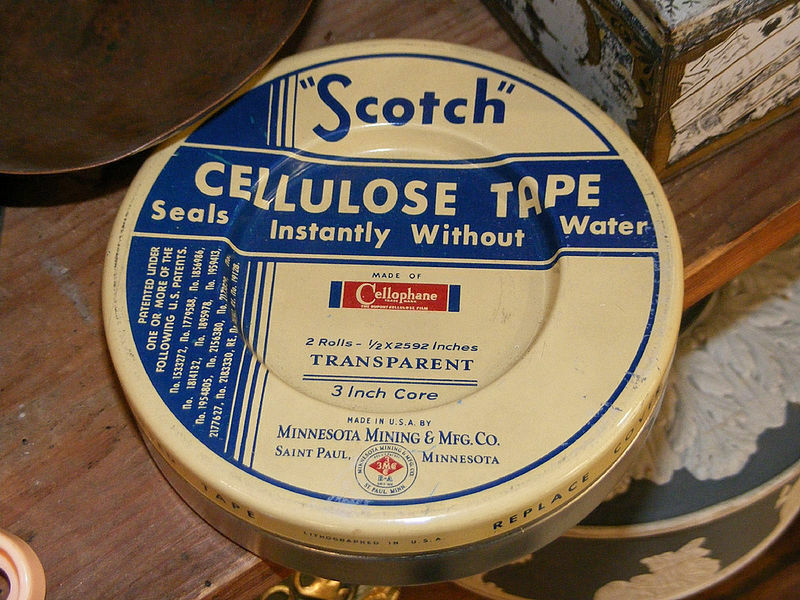 Nonetheless, despite missing their original target market and being released during the Great Depression, the Scotch Brand Cellulose Tape thrived with various home uses. Who Made That Scotch Tape? The Scots do not consider parsimony to be a negative quality. It is not a slur. The aforementioned Americans and Scots were both white, therefore they could not have made a ‘racial’ slur. Why scotch tape are 36 or 72 yards long? What’s the origin of this rule?